Well, that absence was a wee bit longer than I expected it to be! Christmas time is summer holiday time in New Zealand, half the nation seems to go camping and Auckland empties out, making it easy to get into favourite cafes and restaurants! We had various extended family come to stay while I was on leave from my paid job, so I didn't manage to get much knitting work done, but I did manage to get some thinking done and came up with a couple of plans for myself and combined they become the Great Christmas box quest 2012, which is a big flash way of saying that I plan to knit at least one item a month to be placed in my Christmas gift box, to ensure that I do not have that crazy moment 2 days before Christmas when I decide that I must knit all.the.things for my family, which always ends in despair and a feeling of failure. This year I am planning for success. The planning has also spilled over to JustJussi, at the end of last year my employer allowed me to reorganize my work hours from 10-2 Mon-Fri to 8-5 Wed/Thurs/Fri. I am so much happier at my day job as I feel I can do my job so much better with full days, and JustJussi is benefitting from 2 full days a week. The proof of the experiment will be evident this year, which should be much more productive than the last. So, today is my first day back, I have my list, first the social stuff, Facebook, the blog, checking out what everyone has been up to over the past few weeks, next writing the pattern for a wee submission and then tackling the list on the whiteboard...checking the progress of tech edits, test knits and ideas in progress. 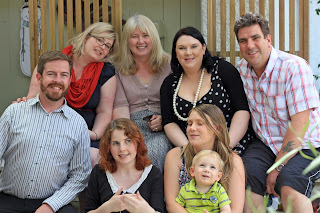 Here is a wee snap of Gordon and I, 4 of our girls (Charlotte is holidaying in Wellington) Holly's husband Nick, and Maria's baby Cody, taken at my Grandmother's 90th birthday this past weekend, youngest daughter Blaise is the redhead sitting at the front, she turns 21 this week, so it's a big week in our family! Happy 2012, it's going to be a fabulous year!